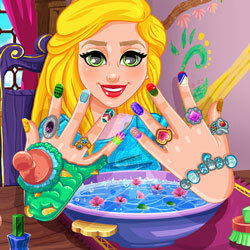 Description: Natalie needs a total makeover for her nails. You will have to apply some healthy treatments for her hands. After that, you will have to trim and buff her nails and apply the prettiest colors and patterns on them. The last but not the least, find the right accessories that goes well with her manicure.